Pixar’s newest release, Brave, the tale of a rebellious princess who turns her mother into a bear, had a bear of a time at the Chinese box office last week, clawing out just $3.1 million during its first 6 days of release ending June 24th. While other studios’ animated feature films have prospered in China’s theaters, Pixar’s films have consistently underperformed there. Brave earned 60 percent less in its first week than Madagascar 3 did in its third, and the Pixar film also trailed far behind a poorly reviewed Taiwanese action film, Black and White Episode I, that opened against it last week. While non-Pixar animated films during the past 2 years have taken in an average of about 7 percent of their worldwide box office grosses from China, Pixar’s films have earned less than 2 percent of their worldwide grosses there during the same period. Every one of Pixar’s recent releases has lagged far behind other U.S. animated films. Pixar’s poor performance cannot be explained by inferior distribution or marketing, since virtually all major Hollywood animated films are handled in China by the same two companies, China Film Group and Huaxia, often working together. Rather, there seems to be something about the Pixar stories, and the way audiences perceive them, that leaves Chinese audiences cold. Whatever the reasons, the performance gap is so striking, and so consistent, that Pixar and Disney will want to address their shortcomings in China if they are to compete effectively against their rivals. This entry was posted in Uncategorized and tagged Alpha and Omega, Brave, Cars 2, Happy Feet 2, Kung Fu Panda 2, Madagascar 3, Men, Pixar, Rio, Rob Cain, Robert Cain, Smurfs, Toy Story 3, Up by chinafilmbiz. Bookmark the permalink. Peter, I’ve given this a great deal of thought and I haven’t yet been able to come up with a convincing, all-purpose explanation for Pixar’s relatively poor performance in China. One acquaintance suggested that the animated films that have succeeded in China are mainly ‘fish out of water’ stories (Kung Fu Panda, Smurfs, etc. ), and that Pixar’s films don’t fall into this genre. What are your thoughts? Kung Fu Panda did well in China because it is about a Panda that does kung fu. The Smurfs and Transformers were on Chinese TVs since the 80s. In these films, the audiences knew what they were about before seeing it. Ray, it’s true that pre-awareness is a big factor in the success of animated movies in China. But Rio and Alpha and Omega also did well in China, so pre-awareness doesn’t always explain success. Likewise, the Chinese audiences presumably knew about Toy Story 3 and Cars 2 before they were released, but those films performed relatively poorly in China. Cars are a relatively new thing in China, and talking toys are rooted in something like a Christmas mythology. Neither are endemic to Chinese culture. The data presented is startling. Given the 4 Pixar movies listed, Brave is certainly not an isolated instance. What is most interesting is that Pixar prides itself on story and characters, two elements that we all know are integral to the success of a movie….. most of the time. Visual effects, 3D, CGI/animation do not make up for bad story. Good work on this Rob. Thank you, Marty. 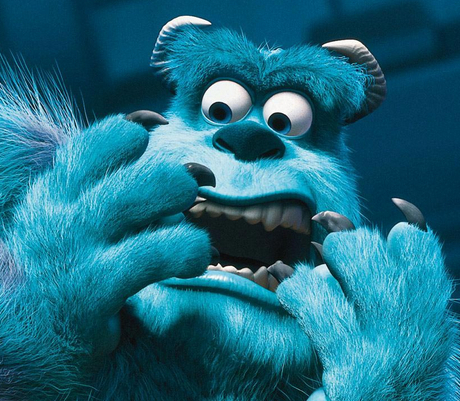 For some reason, Pixar’s style of storytelling hasn’t yet caught on with China’s moviegoers. That’s really interesting given the dominance of Pixar/Disney in the West. I wonder what they are doing to address the issue, as they are potentially losing a significant income. My Chinese colleagues (parents) speculate this is because Pixar movies usually revolve around an unloved underdog who finds happiness in the end by standing up to an attention-grabbing antagonist. Spoiled one-child-policy Chinese kids, they say, relate more to the antagonist than to the underdog. Interesting, Richard. That theory works for Toy Story 3, Brave, and I think for Up as well. My hypothesis is that Pixar is a premium brand in US. It has its own fan base, but in China most people perceive it as another American animation studio. Disney needs to put more efforts to promote Pixar brand, not just a single releases. Thank you for your blog. You really have put China’s movie industry in perspective and pointed out things that natives didn’t see. I am particularly interested in the Pixar issue because I personally love Pixar best among all the animation production companies. 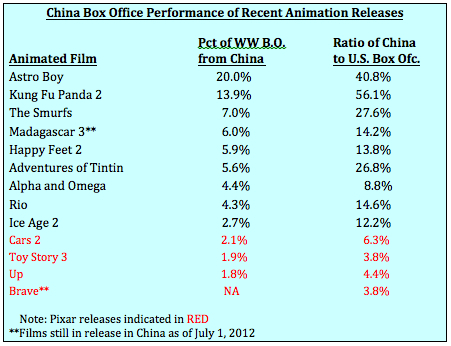 It never occurs to me that Pixar hasn’t done well in China’s box office. But even as a Pixar fan, I haven’t seen Toys, which looks like children’s playing house to me. I know it’s unfair for me to judge just by its name and trailer, but I am just not as interested, or maybe it’s just because I didn’t have a troop of toys as Andy when I was young, like many Chinese children born in the early 1990’s, so I cannot relate to story ☺? I didn’t see Brave either. It’s just like another Disney princess story to me, no unique Pixar factor. Here I am trying to figure out my own theory for Pixar’s failure in China. I discussed this issue with my friend, who is a director, and we agree with “Sprague” that it’s hard for Chinese audiences to relate to the underdog stories culturally. Whatever happy ending the characters have on screen, how happy the nameless small person are, audiences know that the society will still judge you by another set of standards, such as money, a good job, etc. As a result, we expect to see heroes on the screen so that we can enjoy pretending to be them and possessing their bright future for two hours. And you are right, that works especially for Up. In the Chinese culture, seniors are supposed to be a role model, who are also symbolization of wisdom. Just think about the Master in Kungfu Panda. They should be like a quiet big old tree, able to offer young people advice anytime. The old gentleman in Up just contradicts the Chinese requirement for traditional seniors, and he might be made fun of because he is considered too playful, stubborn and abnormal. The culture theory works for Cars too. I guess the popularity of Cars is largely based on American’s nostalgia for the automobile culture in the old times, which Chinese people don’t have. I agree with “Tsturm2010” that Chinese people don’t have an attachment so strong as Americans to their cars, let alone cars are still luxuries for most families in China. Then why do other movies do relatively better than Pixar? Somehow I think those other movies cater to the “spring festival gala” appetite of Chinese audiences more than Pixar. When I look at Rio, Madagascar and Ice Age, I find them share something with the Spring Festival Gala of CCTV. This is just a metaphor. I mean animations doing better on box office have different factors to guarantees different generations of the family can watch together, take whatever they want from the movie and laugh at different points, just like the Spring Festival Gala containing magic, singing, dancing, stand-up comedy and Peking Opera to ensure grandson and grandpa can both watch. Pixar is more like a responsible story-teller focused on elaborating a single story and requires audiences to follow closely with the plot, which might be a little boring/demanding for Chinese audiences. In addition, branding plays a very important role. Pixar is so unique and attractive to me, such as its wonderland-like offices and its interesting people, but Chinese audiences just view it as another Disney-like animation company. Social media can also help a lot. I don’t think Despicable Me 2 is good, but the rumor that it wouldn’t be introduced to China actually made it more popular last year, because suddenly many entertainment accounts on Weibo posted pictures of the yellow people, making people want to see it more. In contrast, I didn’t see many as much publicity on Weibo during the Monster University period. However, Pixar is very popular with Douban users, who are relatively young, open and easy to accept Pixar’s view of points. Maybe Pixar can try to make the best of that group, target at more specified social media, and then try to expand? Those are just my amateur opinions.